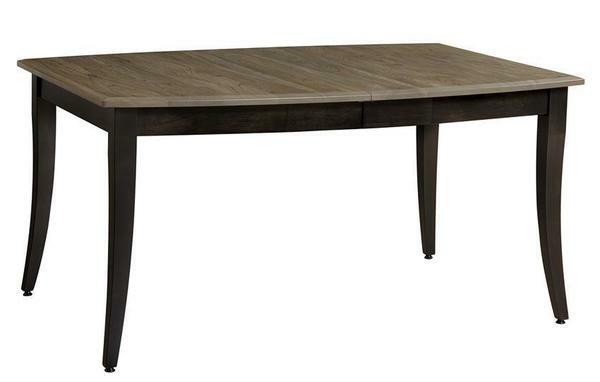 Create a dining room to remember with our Amish Manchester Self-Storing Dining Table. Handcrafted just for you in a small, family owned and operated woodshop near Myerstown, PA, this piece will exceed your expectations for many meals to come. By bringing the excellence of the American heritage of furniture right into your living space, not only will you be supporting American jobs and products, but you will be able to experience the difference of a table made with the utmost care. This piece's gently flared legs make for a subtle style that will suit your space effortlessly. You'll love the convenience of not only the option for leaf extensions but the ability to store them inside your table with ease. This feature frees up space so well, you will forget it's even there! Be sure to take a peek at our Amish Manchester Dining Room Chair. These pieces are a match made in heaven and will create warmth at every meal. Using lumber harvested from the Appalachian Mountain region of the USA, talented craftsmen adapt to the latest innovations while still maintaining a timeless technique. This gives you the best of both worlds for every piece of furniture you order. This piece, along with every other item in our Keystone Collection, comes with a Lifetime Guarantee to ensure your peace of mind. How's that for satisfaction? Multi-Species Elm and Clear Maple image shown with Elm table top in Sanibel Stain and Clear Maple base in Charcoal Stain.